to the beckoning deep within our hearts. 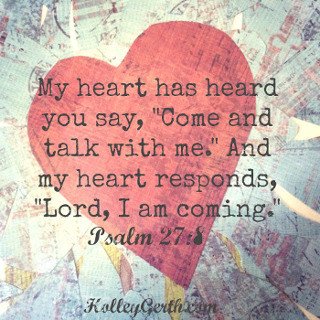 “Come and talk with me,” says the God who created the universe. It’s what someone who loves us would lean and whisper. What an encourager who wants the best for us would offer. What a dear friend would say to us when we’ve been missed. for a moment just talk to the One who created you and cherishes you. gets lost in our loud world. Only He knows the words our hearts need most as we begin a new week. There’s a call for your heart. It’s been there since the day you were born. And it will be there until the day you go Home. That call isn’t about a vocation. It’s about making a difference wherever you are. It’s about being who I created you to be. No one else can take your place. No one else can answer this call. every day, every step of the way. I called you....I have chosen you and not rejected you. I have chosen you and have not turned away from you. 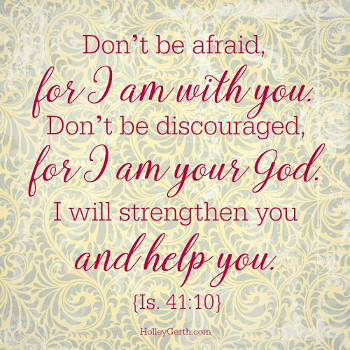 I will give you strength, and for sure I will help you. and working on our behalf. We will never walk into a room where He isn’t already there. We will never receive news that He hasn’t already heard. We will never face a challenge He hasn’t already overcome. Nothing surprises God because He knows the past, present and future. He can’t be derailed, disappointed or deterred. He doesn’t become discouraged. He doesn’t grow weary. He doesn’t give up, give in or let go. God has endless capacity so He is the only one who can truly handle everything. Nothing is too big for Him. And nothing is too small. He can do it all. Every limitation that causes us hesitation will not slow Him down. He has promised to be our help. He has promised to be our hope. He has promised to get us through whatever happens. He has a plan for us and it’s good. We can trust Him to complete His purposes for our lives because He loves us. God is on our side. And He is by our side. With Him, we have everything we need for this day, tomorrow and forever. Our hearts ask the hard questions. The exclamation mark at the end of God’s declaration of love for us.